Leading Distributor / Channel Partner of Swati 11mm Tradition Automatic Retractable Bollards, Swati Semi-Automatic Retractable Bollards, Swati Fixed Bollards And Posts and Swati Luxor Automatic Retractable Bollards from Mumbai. The casing cast in one peice, integrates cast sliding rails and mechanical supports in the same block. It has a very high impact resistance as it is formed from cast steel up to 24 mm (7/8″). The cover cast from steel in one piece with a 10 year warranty, fully protects the bollard. Shock energy received by the bollard is divided via it’s long jacketing into the counter components before disipating through the embedded casing. A guiding ring of thick plastic eases the travel of the bollard up and down reducing friction and noise. The bollard head, 11mm (2/8″) thick provides superior mechanical resistance. A solid, single piece, it integrates the guide rails and is designed to work without wear or tear for very limited maintenance. Semi-automatic retractable bollards are set in motion with a key that unlocks the mechanism. A push on the bollard’s head will make it sink into the ground; locking in the retracted position is automatic. A simple turn of the key will make the bollard rise back by itself and lock in the upward position. Semi-automatic Retractable Bollards are the ideal solution for a wide range of varied applications, including restriction of parking spaces, reservation of site for deliveries, regulation of urban flows and security for public buildings or private residences. We are confident in our know-how and experience, and can therefore offer specific models based on drawings made by architects or even with the help of our research department create unique designs for your project. Our range of fixed bollards and posts are most suitable on public or private grounds to border roads, parking areas or simply to protect grounds where vehicles should not be allowed in. These bollards are manufactured in cast iron, but also in steel, stainless steel and even wood or stone on request. Fixed bollards are usually embedded in concrete at their bases. The shape of the embedding base may differ depending on the model and may be extended on option to increase impact resistance. We can also manufacture bollards that are fixed to the surface using anchoring bolts – ideal for those impromptu installations where no roadworks will be allowed or possible. The forms and dimensions of the Generation 6 range are identical to the automatic and semi-automatic retractable bollards, making it possible to maintain aesthetic harmony in your urban developments without sacrificing functionality. Luxor, the newest addition is a technologically advanced product that will hold up to any challenge. 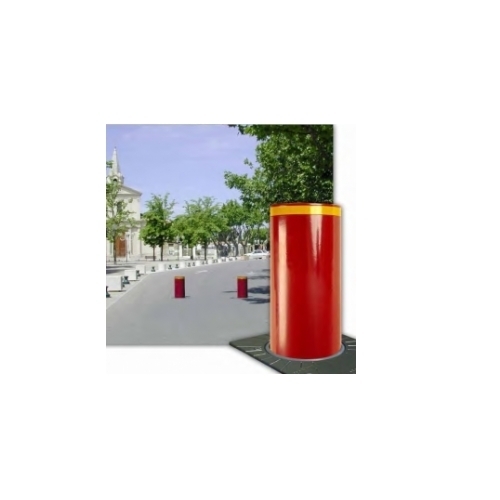 It is a retractable, pneumatic bollard, developed to meet any and all requirements. Luxor is the ideal answer to the requirements of heavy duty private use and public applications: business centres, supermarket chains, car dealerships, and historical centres where aesthetics are as important as public safety. The movement of the Luxor pneumatic bollard is signalled by a double device consisting of: light and sound, to prevent any inadvertent impacts by pedestrians and cyclists. The new illuminated ring is composed of 12 intensive bright LEDs that improve visibility of the bollard in any weather conditions, during the day or night. The acoustic signal guarantees the safety of any pedestrians walking too close to the manoeuvring area of the bollard.